Relatividad de la distancia / Distance relativity, originally uploaded by victor_nuno. No es por la relatividad del tiempo por lo que se empieza, sino de la distancia. No se mide en metros, o en km. Sino en minutos, horas, días. Las distancias desaparecen, dejando lugar a la medida del tiempo, … la medida de la vida. It isn’t time relativity by what one starts, but distance relativity. One doesn’t measure in meters, or in km. but in minutes, hours, days. Distances disappear, leaving place for the measure of time, … the measure of life. 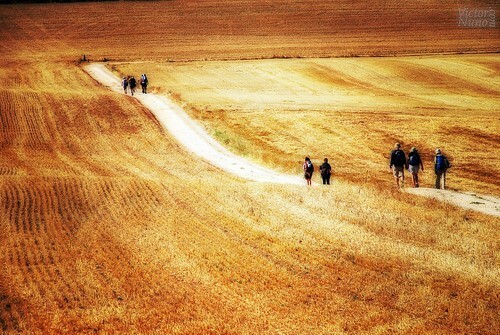 camino de santiago.. have you walked it?? jaw-dropping in depth. great storytelling too! I’d love to do the Camino one day…..
Carmen, thank you so much. And yes, I’ve walked it. I can even say that it is a big part in my life already, in many respects (it’s a long story). It is something I would always recommend everyone to do. It is really worth it, at least once in a lifetime, whenever it is and regardless of the age. About the dryness, I really like it. It feels like leaving unneeded things behind. Monica, multumesc! Time being a measure of life, … there is another thing that changes while walking: the concept of time. It is not only distance. Hope I find the adequate photograph + text for this! Farl, salamat! Your visits are always an honor, and especially when you find something here :-) Best regards to all family! Francisco, muito obrigado! e também para o convite. Espero um dia a visitar Porto! Hola, soy administradora de un grupo llamado Concepto, idea (Sólo FOTOS) y nos encantaría agregar esto al grupo. ¡Cuánto movimiento tiene esta foto! Qué bien integrados están los caminantes en la diagonal y qué buena combinación de ondas y rectas. Y muy bueno el texto. Please tag your image with "infinestyle"
Perfect symmetry, warmth, and words. I really like the meaning behind the image,… it really is heart felt. Precious! Sending a hug to a brat! … and congrats on explore! plus, your words are beautiful and meaningful, too. Hi, I’m an admin for a group called Chapeau! (invited only), and we’d love to have this added to the group! Seen in "Chapeau! (invited only)"
-peek at my pics, pick your favs, leave your comments, Go Beyond The First Page. Otra vez aquí… no puedo resistirme! Campos de oro, peregrinos y el camino a seguir. Puede existir una gran distancia entre personas muy cercanas y ninguna a pesar de los continentes. Cómo medir la distancia? Y que gran foto, amigo. I love the golden hues and the excellent composition! Gorgeous! Hola, soy el administrador de un grupo llamado Ecopoética – Ecología artística o Arte Verde- Green Art y nos encantaría agregar esto al grupo. Una buena foto y supongo la experiencia de Camino de Santiago aun mas. This particular shot has a lot of depth to it. Están ESPECTACULARES tus fotos… un agrado enorme pasearme por tu Flickr, Víctor!